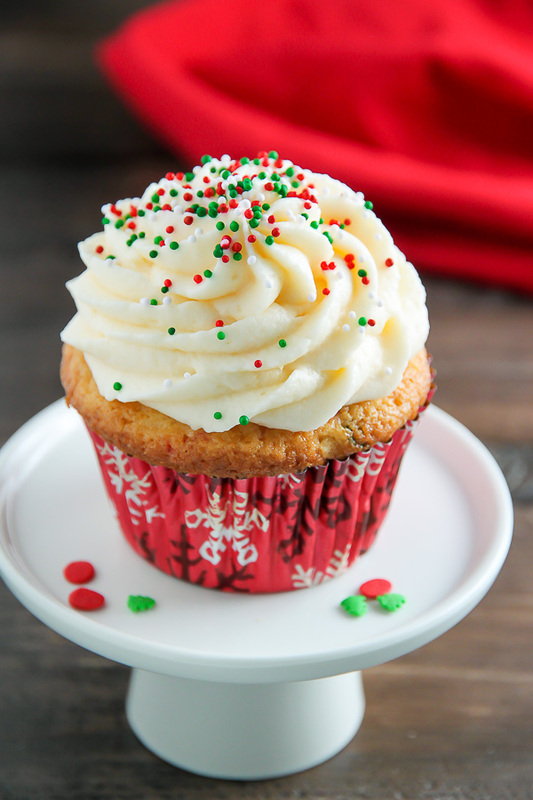 Showstopping soft and fluffy eggnog cupcakes are made in just one-bowl! Holiday dessert the easy and delicious way. YES! A month or so back I spotted eggnog at the grocery store and couldn’t resist swiping it up. Full disclosure: I bought 4 cartons! I freaking love eggnog and crave it 365 days a year. I also love baking with it. 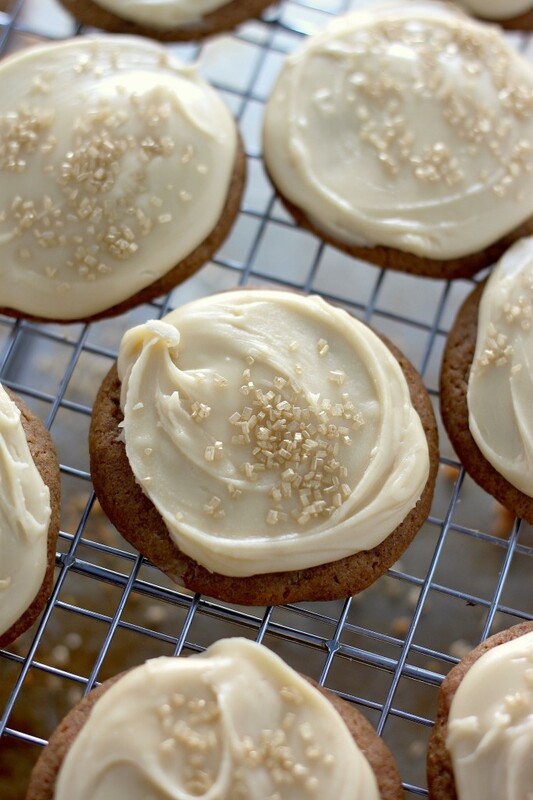 Eggnog makes the very best base for flavorful holiday desserts. So far I’ve made a batch of eggnog snickerdoodle donuts, an eggnog dutch baby, eggnog cinnamon roll pancakes, and 3 batches of eggnog cupcakes. Which brings us to today’s recipe! 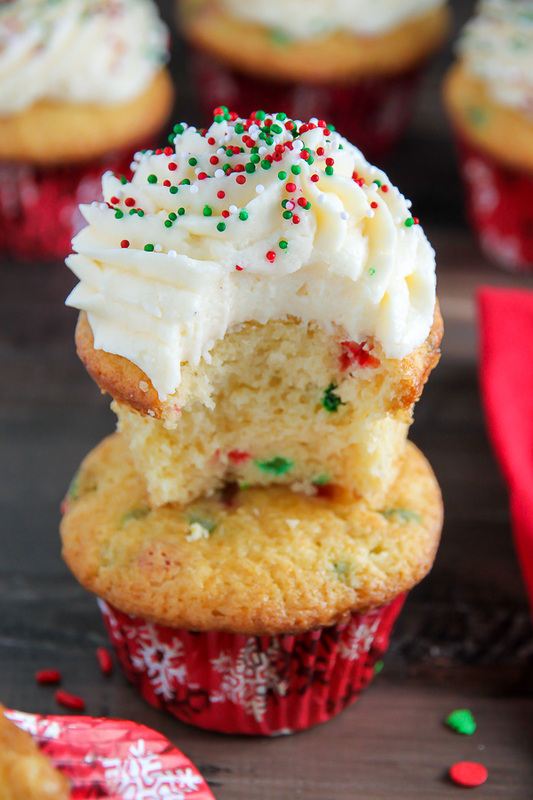 One-bowl eggnog funfetti cupcakes topped with the fluffiest eggnog frosting! They’re so easy, so festive, and so perfect for your holiday dessert table. Let’s not waste another moment – time to dive into this delicious recipe! Which is an adaption of my perfect “one bowl” vanilla cupcakes. 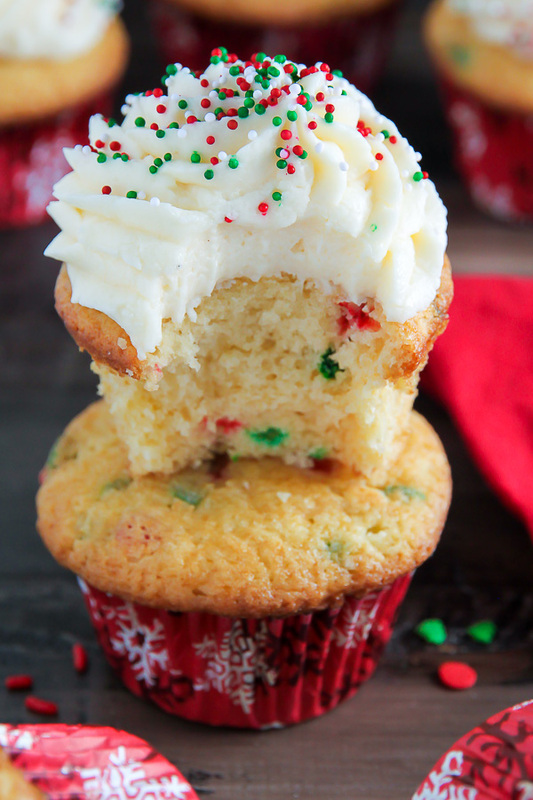 For these cupcakes you’ll need flour, cornstarch, granulated sugar, baking powder, salt, butter, vanilla, eggs, eggnog, and sprinkles! 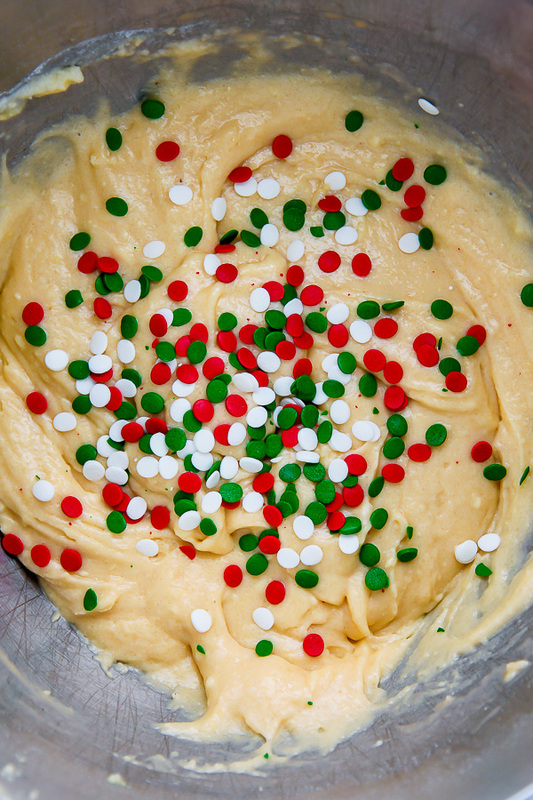 I recommend using Christmas Confetti or Holiday Jimmies in the batter, and then decorating the fluffy eggnog frosting with Holiday Nonpareils . I do not recommend using nonpareils in the batter as their colors easily bleed into the cupcake batter and result in more of a tie-dyed cupcake. In this recipe I use Bob’s Red Mill Organic Unbleached White Flour, which is freshly milled from Organic hard red wheat and is not enriched with any additives. This is my #1 choice for flour because it’s incredibly versatile and produces light, airy baked goods. You will combine the all-purpose flour with a little cornstarch to create homemade cake flour. Cake flour ensures your cupcakes will bake up pillow soft and fluffy each and every time! The dry ingredients are tossed together in a large bowl, then you’ll add in your soft butter, eggs, vanilla, and eggnog, and mix mix mix until combined and almost smooth. You likely have a few bumps or lumps left – don’t worry about them! It’s better to have a bumpy batter than an over-mixed one. Folding in the holiday sprinkles last. Then simply scoop the batter into a lined muffin tin and bake for 18-20 minutes. 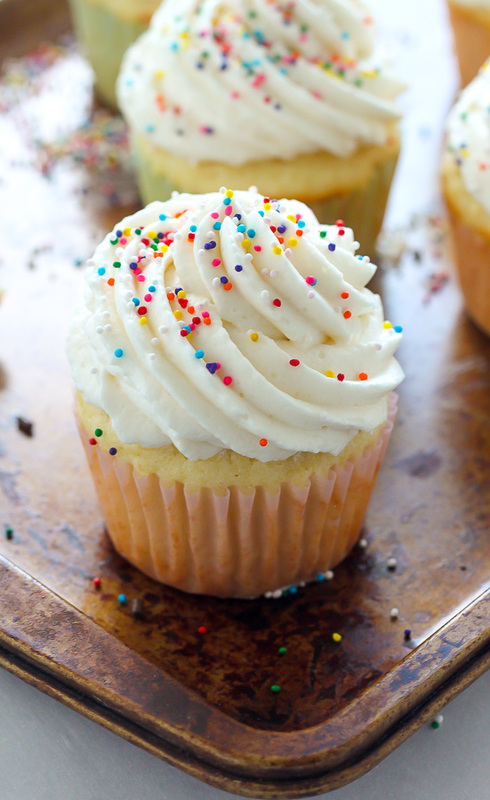 Warning: these cupcakes will make your home smell like a bakery!!! 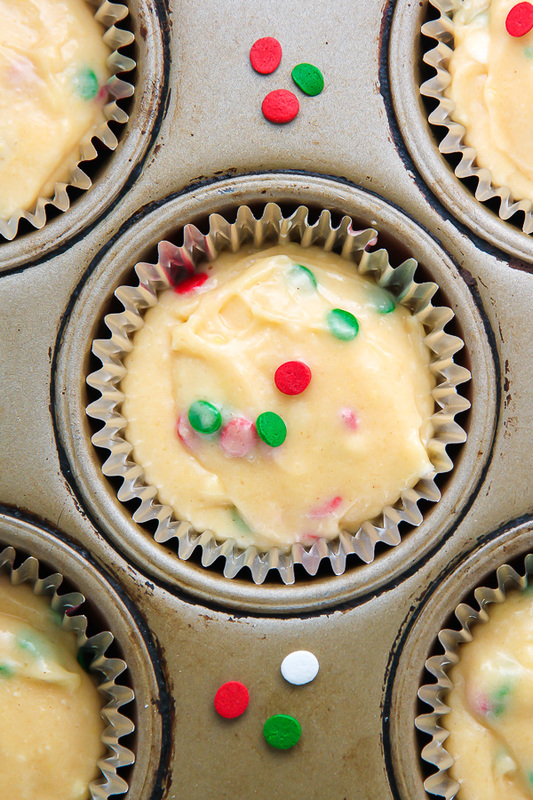 Distract yourself by making the eggnog frosting! For the frosting you’ll need butter, confectioners’ sugar, eggnog, and vanilla extract. You’ll beat the butter smooth, add in the confectioners’ sugar, then slowly add in the eggnog and vanilla. You’ll want the frosting just stiff enough to hold its shape. I piped the frosting on with this Wilton star tip , but feel free to go the old-fashioned route and slather it on with a butter knife! Tip: To make this a true one-bowl recipe, quickly wash out the bowl you used for the cupcake batter, and then re-use it for the frosting. This recipe is literally a piece of cake. 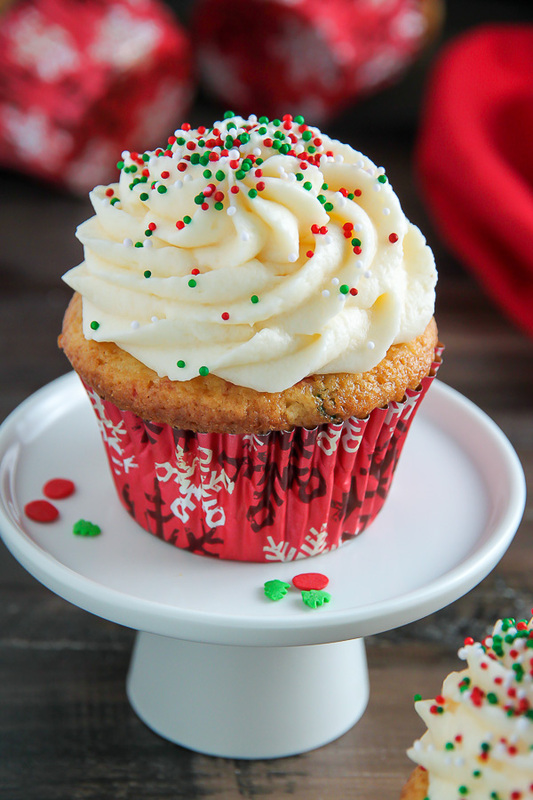 Soft, fluffy, spiked with eggnog, and exploding with holiday sprinkles. What’s not to love?! 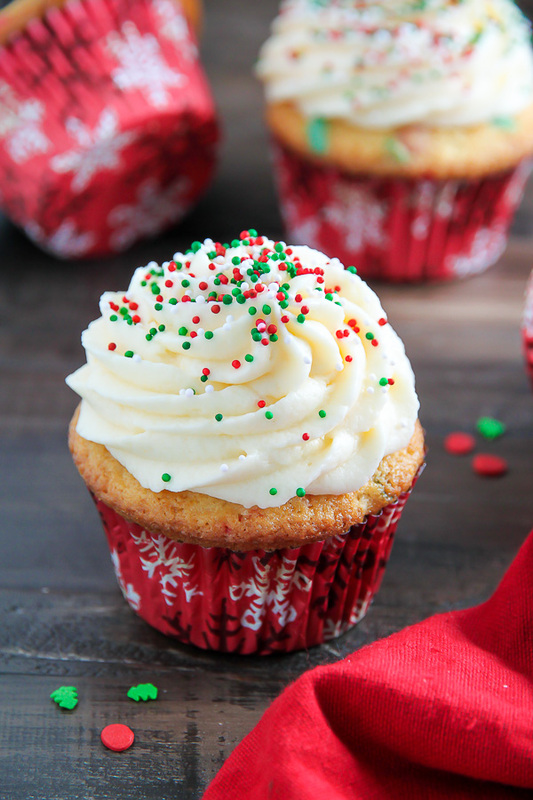 A recipe for easy eggnog cupcakes topped with eggnog frosting. Preheat oven to 350 degrees (F). Line two 12-mold muffin tins with paper liners; set aside. Add all of the dry ingredients to a large bowl; whisk well to combine. Add the softened butter and vanilla, and mix with a handheld electric beater until the batter resembles a course meal. Add the eggs, one at a time, beating well after each addition. Add eggnog and sour cream and mix until combined. Fold in jimmies with a rubber spatula. Divide batter evenly among prepared muffin tins (filling about 1/2 way each) and bake, one pan at a time, for 18-20 minutes, or until the tops of are golden and a cake tester inserted in the center of a cupcake comes out clean. Cool completely before frosting. In a stand mixer or in large bowl using a hand held electric mixer, beat the butter on medium-speed until smooth and cream; about 2 minutes. Reduce the mixer speed to low and gradually add in the confectioners' sugar together; beat smooth. Slowly add in the eggnog (you may only need 1/8 cup) and vanilla extract, beating until slightly stiff and well combined (about 3 minutes). Refrigerate for 10 minutes then frost cooled cupcakes. 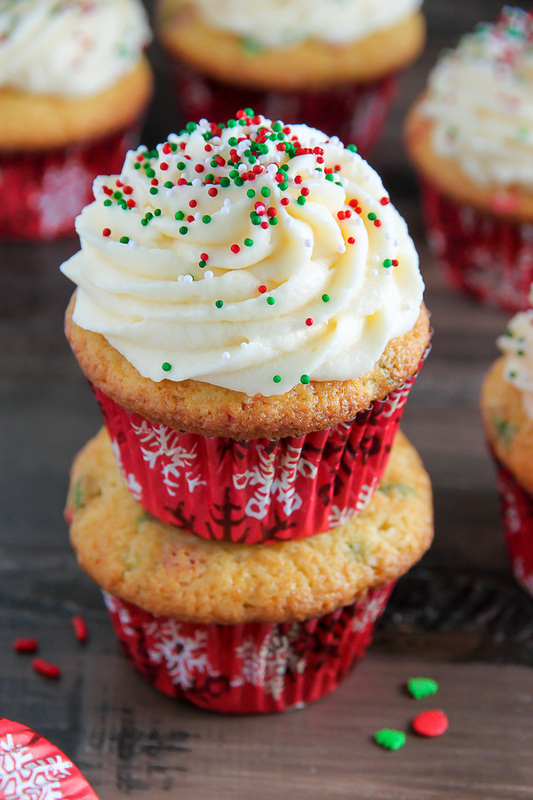 Top freshly frosted cupcakes with sprinkles. *The butter must be very soft for this recipe to work. *You may completely leave the sprinkles out of this recipe, if desired. 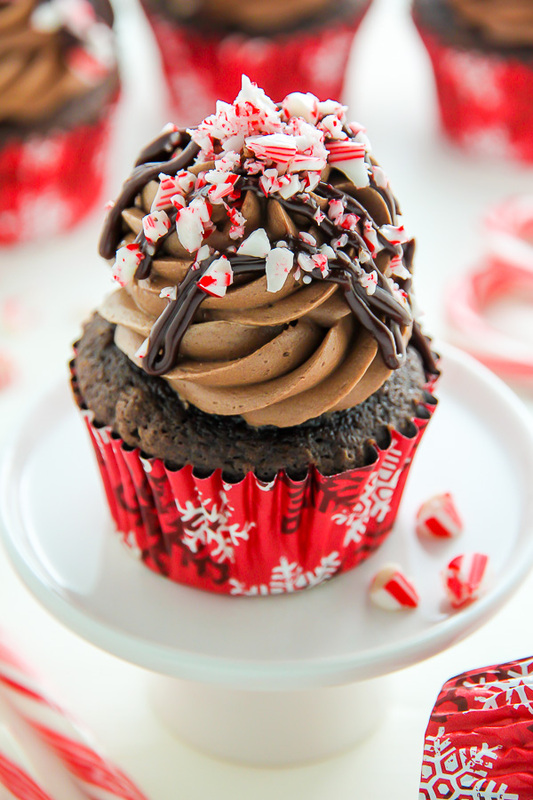 *Cupcakes will stay fresh, stored in the fridge, for up to 3 days. Bring to room temperature before serving. I made these and thought there was way too much sugar in them. I’ve never seen so much sugar in a cupcake batter. They didn’t raise well and were crunchy on the edges. Is 2 cups correct? Hi Lena. As you may see in my photos the edges are a little crunchy but the interior is super fluffy. I’ve also never had any issues with them raising. By any chance is your baking powder expired? I always use 2 cups of sugar in this recipe (it is for 2 dozen cupcakes, which is why it may seem like a lot at first glance), but you could try cutting it by a 1/4 cup next time if you’d like. Thank you for your honest feedback. I’m always looking for ways to improve! Only like using cake flour can I omit the cornstarch in this recipe? Hi Emtesha. Yes, just increase the amount of cake flour to 3 cups. What if I don’t have sour cream?